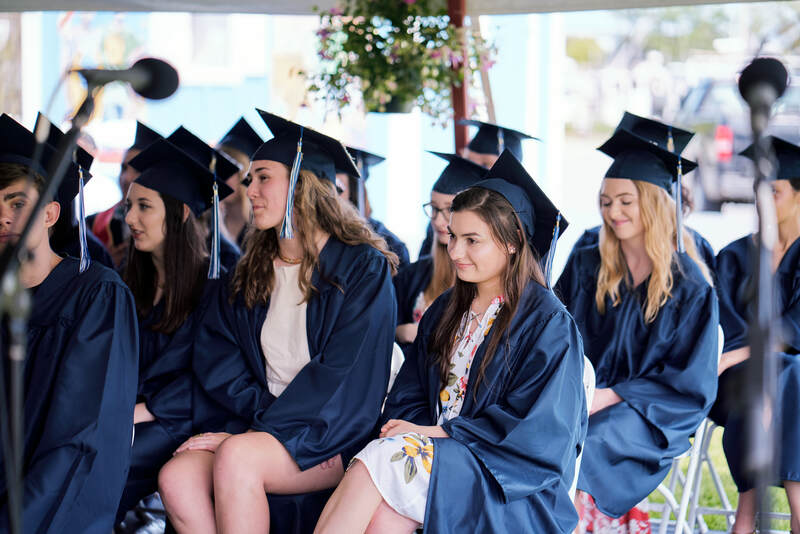 June 2, 2018 was the perfect day for the 17th graduation of Sturgis East and the 5th graduation of Sturgis West. 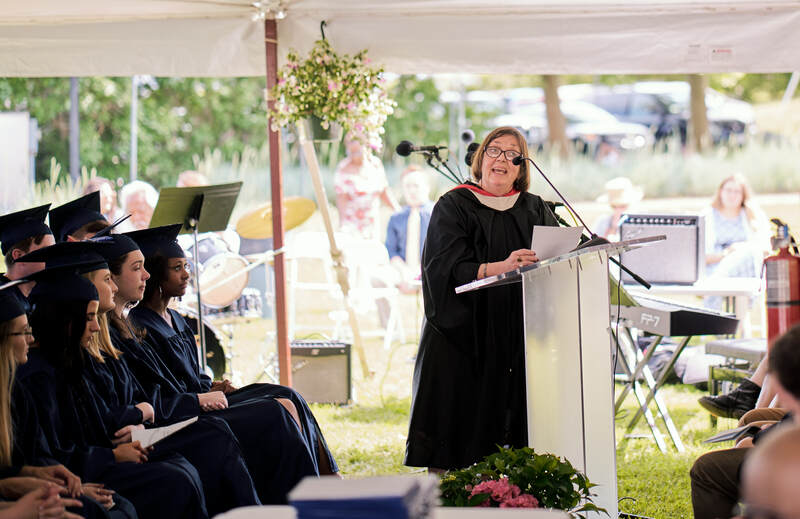 Both graduation ceremonies were held at Aselton Park overlooking Hyannis Harbor. The day of festivities began with Sturgis West graduation at 10:00 AM followed by Sturgis East graduation at 2:30 PM. 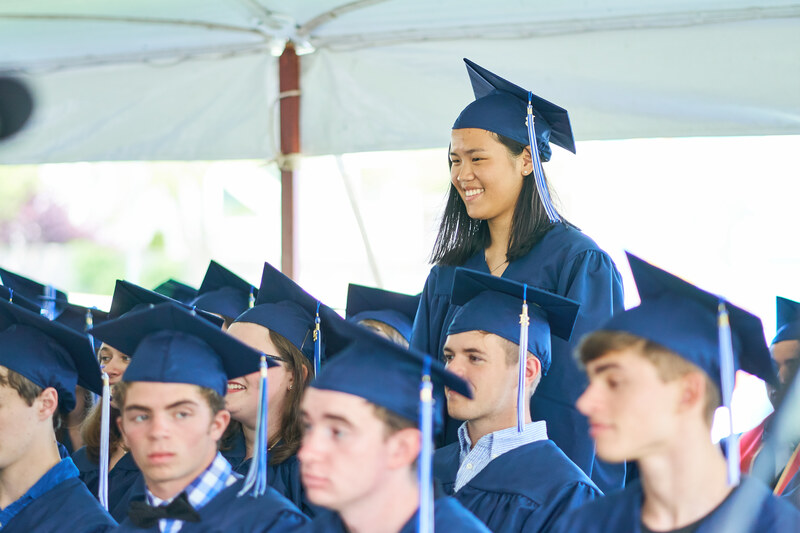 This article includes full text of graduation speeches along with links to videos of several speeches and a selection of photographs by Jarvis Chen. 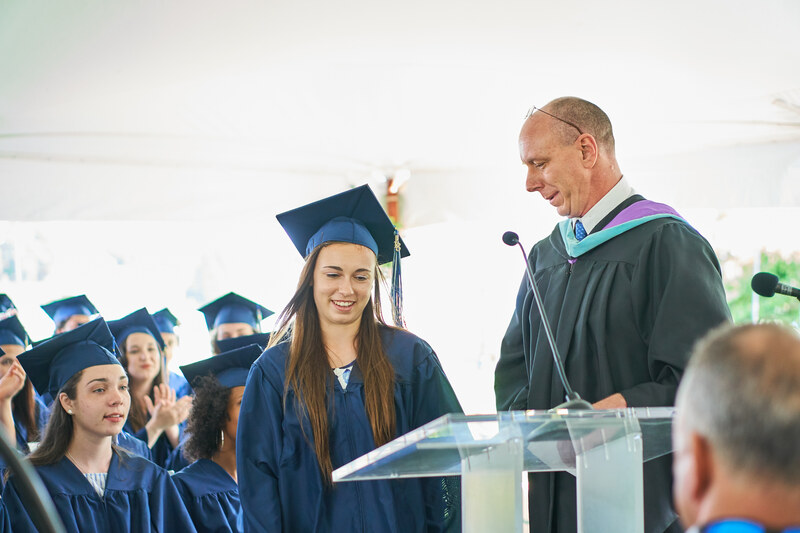 We hope the speeches, videos and photographs capture a bit of the spirit of the 2016 Sturgis East Graduation. 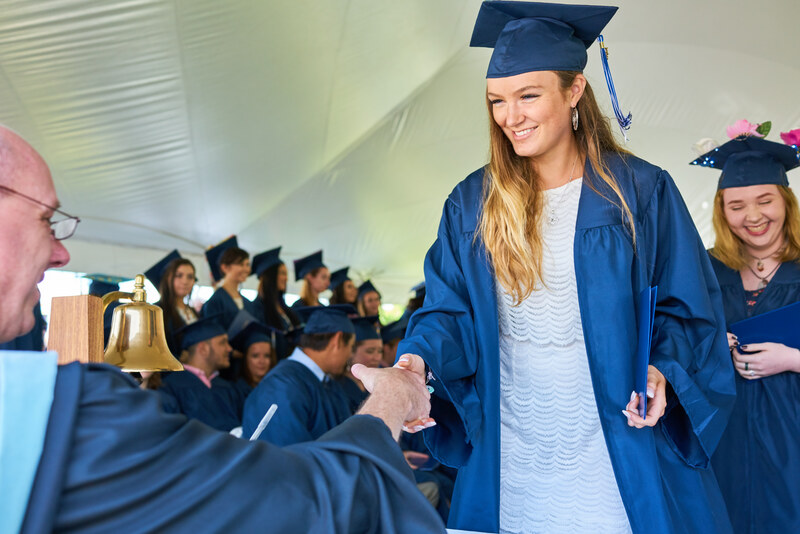 Sturgis graduations are a wonderful celebration of the achievements of our students. 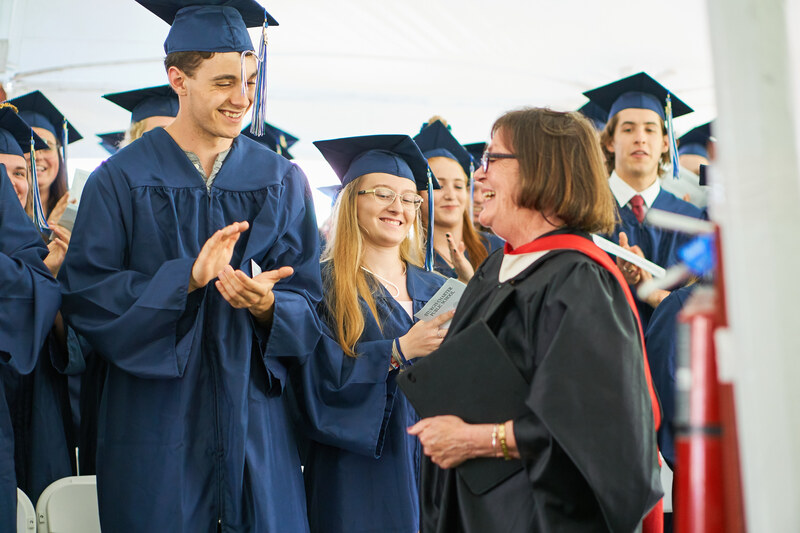 The ceremony incorporates several nautical traditions that reflect our maritime setting and connection to Captain William Sturgis (1782-1863) for whom our school is named. 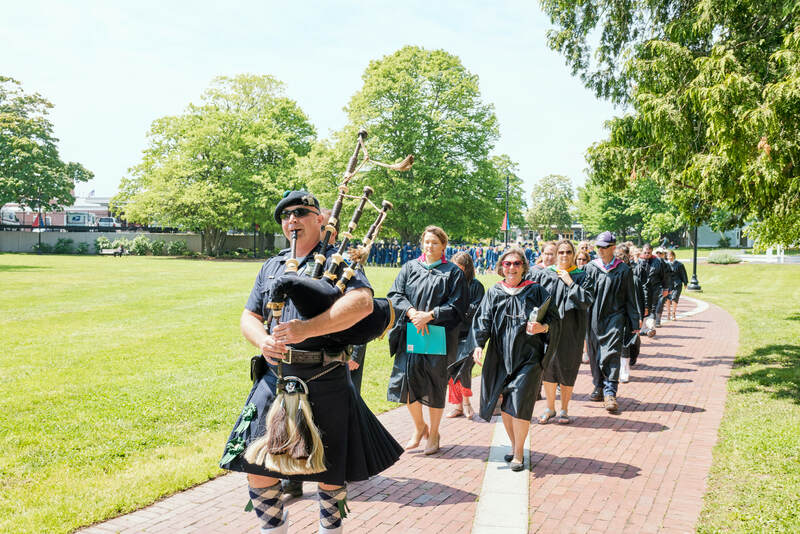 Decked out in the finery of robes and led by Paul Marble along with bagpiper Robert Ferguson, Sturgis grads march with faculty down Main Street and through the Village Green to Hyannis Harbor where they enter a shining white tent filled with people who love them and have traveled far to be present at their commencement. 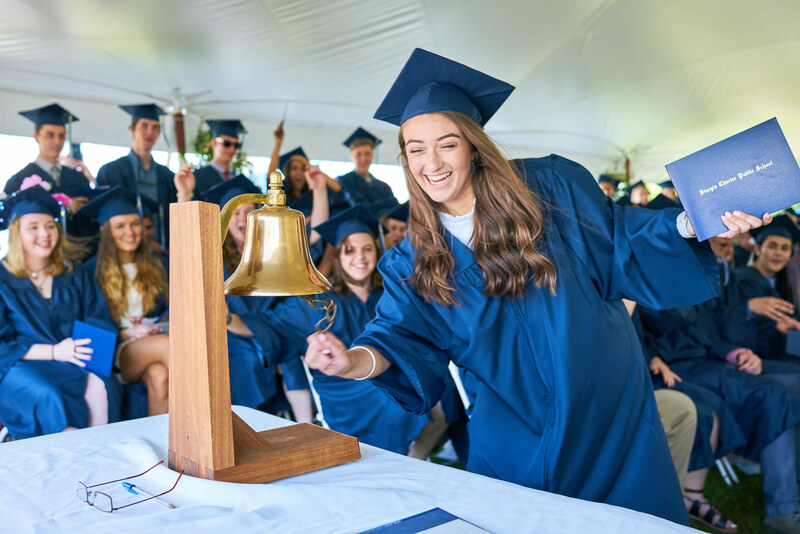 No graduation is ever complete without sounds of the harbor in the background – including ship’s bells and an occasional blast from a ferry’s horn. After receiving their diploma, each graduate proceeds to a table displaying a ship’s log. When students first begin their journey at Sturgis, they sign the log. Just as William Sturgis signed on board for his first voyage, students “sign on for a term of duty,” signifying their request to begin the voyage. 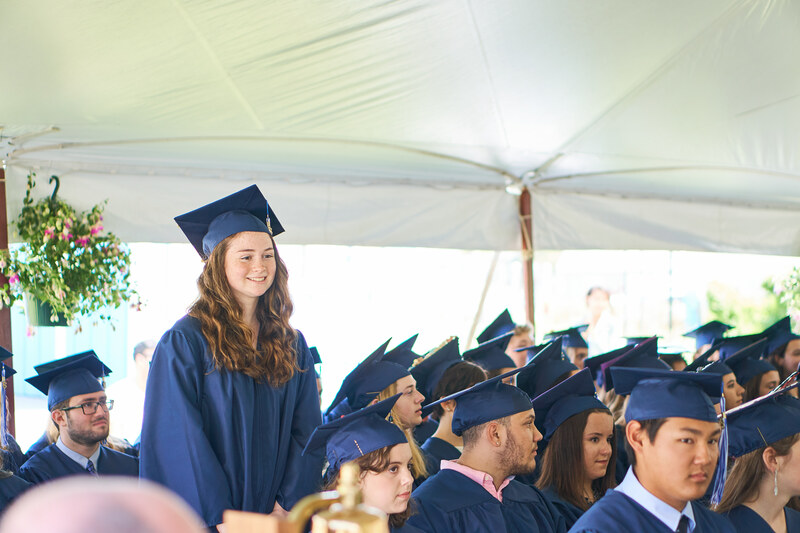 At the end of graduation, students “sign out” next to their original signature, signifying completion of the voyage. The lucky last student in each class (alphabetically speaking!) is given the honor of ringing the ship’s bell. 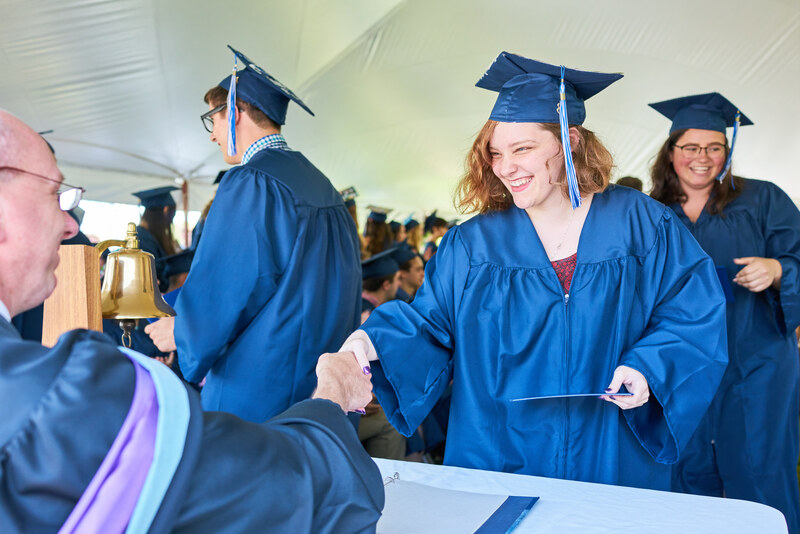 Sturgis East Class of 2018, Parents, Faculty, Board of Trustees, Relatives, & Friends: today is a momentous day. 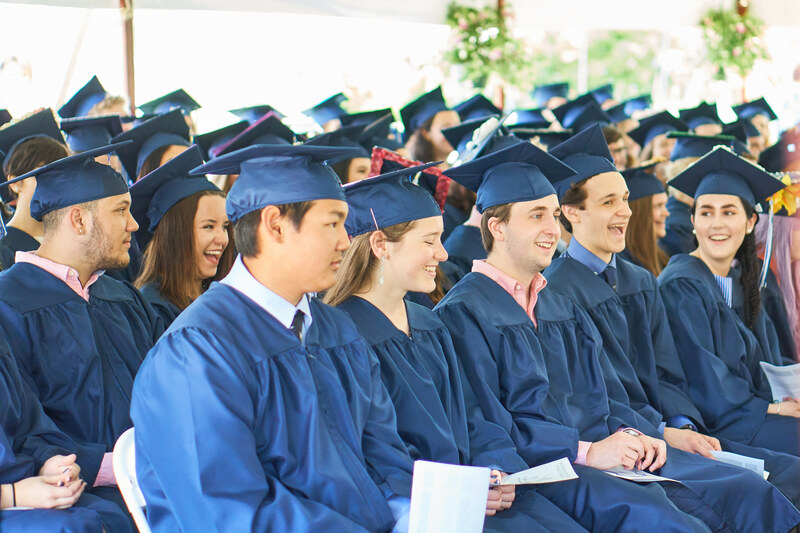 Eighty-nine Sturgis East seniors – soon to be graduates – sit behind me, expectantly. 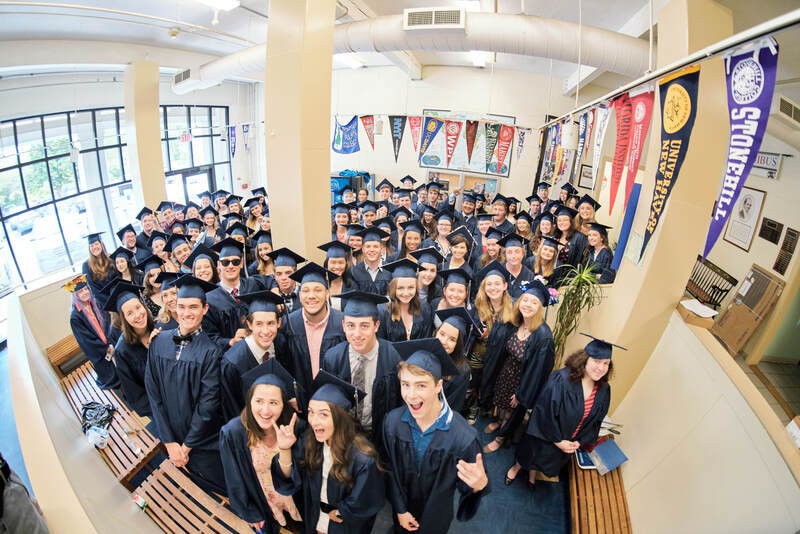 They are nearing the end of one journey, about to embark on another, and for the last time each of these eighty-nine people will be an active part of this special group – the class of 2018. We gather here near the edge of the ocean on a beautiful June day – the sky is blue, the grass is green and the air is pleasant – and listen to people who care deeply about Sturgis and each other. 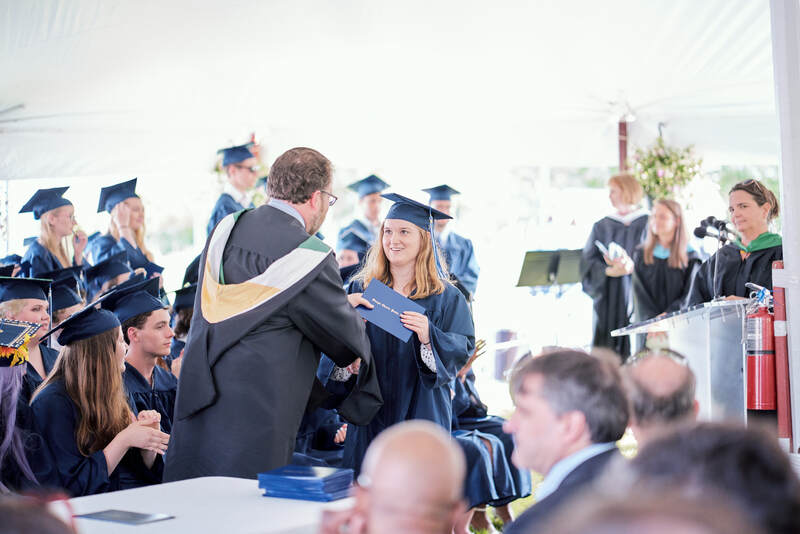 We see the looks on graduates’ faces when they are handed their well-earned diplomas. We bask in the pride, joy, and love on the faces of those who came here to celebrate. All of this feels quite momentous to me. 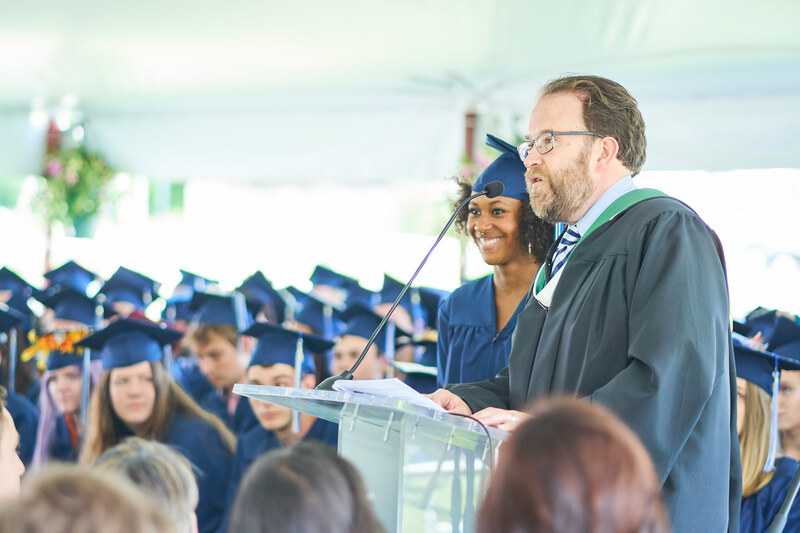 As our soon-to-be-graduates are IB students, they may have held that statement – today is a meaningful day – up to closer scrutiny: “But, Mr. Marble, how do you know it is a momentous day” for us? I assume so based on what many of you wrote in your graduation speeches. You see, parents and friends, we have a custom at Sturgis that every senior writes a graduation speech, and a committee of faculty chooses the two speeches that are most evocative of our Sturgis beliefs and values to be given at graduation; you will hear from Thea Goldman and Virginia Preston, shortly. I have had the pleasure of reading all the speeches, and I would like to continue our custom of sharing select passages from these speeches with you today. and if you know Mr. Tallman that means something because he’s already got a pretty big ego. He said we’d all probably feel the same, that we’d have nothing to say that’s worth saying because what right do we have to stand up in front of a hundred people and try to teach them something they probably already know? But then he reminded us that we have all the right in the world. We have the benefit of being here, in this moment as we stand up on this stage feeling every part of the last four years; the good and the bad- hopefully mostly the good. Whose better to talk about endings and beginnings than any of us as we embark on the next chapters of our lives? From Josh Nawoichik: Hey, I’m Josh. I am going to begin with an apology. I am sorry for my insufficient homework completion throughout senior year. Surprise that’s my senior prank. Really fooled you didn’t I! 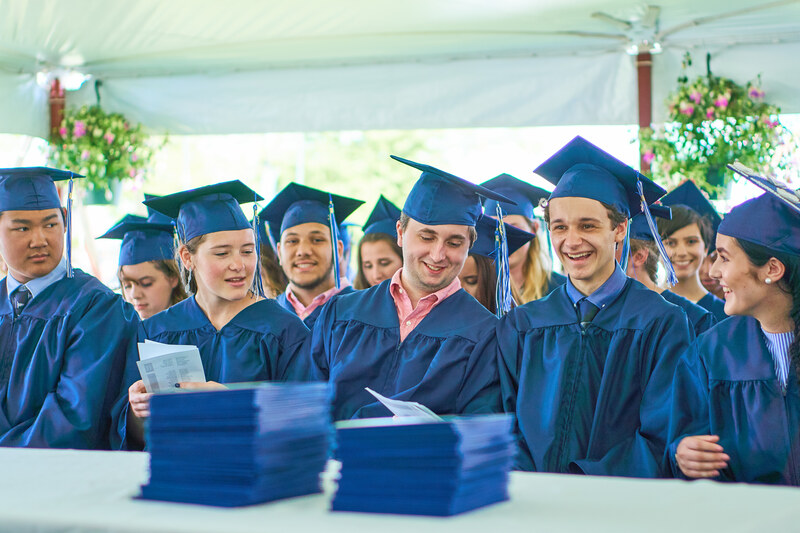 who have helped to lead us through this period of adolescence and who helped drive us all the way to Hyannis for school, sports practices, music and theatre rehearsals, and who were all so relieved when we all-at least most of us-learned how to drive. And thank you to everyone else who helped to get us all to where we are today, from the wild group of freshman we were in 2014, to the mature and accomplished group of seniors you see before you. From Kristen Gregg: Over my time at Sturgis, I have found how to properly express myself, which was by not caring about my image. As we learned when we discussed identity in TOK, we have an outside and inside persona. I am not only my outside personality. The only thing I need to be concerned with is I am being true to myself, and that includes admitting my shortfalls. I faced this the most when I was in Belize. I did not know how to cook, or put up a tent, or even wash my clothes by hand. I had to ask for help, which was something I wasn’t accustomed to. Instead, I was used to doing all the things I knew I could do and being the role model as someone who knows what she’s doing. But in Belize, I wasn’t her. I was uncertain. I had to admit I didn’t know what I was doing. It made me uncomfortable to ask for help when I would rather try to figure it out by watching someone else or do it on my own. But once I did, I found those who answer are happy to help. This led to the realization that I don’t have to be afraid to ask for help. After the trip, I found easy in asking for help in classes and at my new job. I finally understood at Sturgis, you never had to be afraid of asking for help because everyone there is willing to give it. By asking for help, I could grow. From Jessica Whelpley: Four years ago, I was secretly hoping that I would not get into Sturgis. When I applied, I was excited about the abstract concept of leaving my old school, of meeting new people and joining new clubs and being in a new and strange place. But as the day of the Sturgis lottery drew nearer, the reality set in of leaving behind everything I had built, of leaving behind all of my friendships and all of my routines. At the time, I viewed this as the biggest decision of my life. What if I didn’t make friends? What if the IB was too hard? What if leaving behind what I knew was the worst decision I would ever make? All of these apprehensions were gnawing away at me as I sat in my room praying for bad news. I didn’t want to have to choose between an outstanding education and happiness. But I did get in. And I did decide to leave behind everything I knew and venture out into the unknown. With that single decision, I began the most formative, most influential, and most wonderful journey of my life. From Ted Sandland: I first entered sturgis in 5th grade. I was off school for the day so my mum brought me into her class; it was HL seniors. For fun I took a copy of what the class was doing and was extremely confused as to how their “math” did not seem to have any numbers. Now as a senior taking HL math, I now understand that they were just as confused as me. In middle school I was a troublesome child, I used to get yelled at and kicked out of class for back talking the teacher, and eating Chinese food in class. And once I was sent to the vice principal’s office for not wearing shoes. However at Sturgis the teachers seems to be amused by the same antics that angered my teachers in middle school. My Sturgis teachers treat me as a person and listen when I am speaking. They give me respect and in return they get it back. 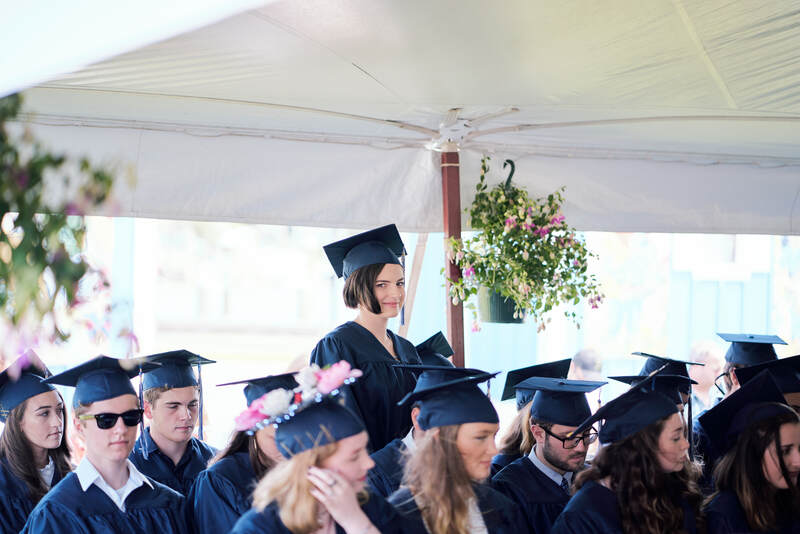 From Grace McLaughlin: Something that really stands out to me when I think about what I enjoyed about Sturgis was the ability we had to get very off topic in class, while still managing to get through the material. I know this is probably not what the administration and parents would love to hear, but don’t worry, because we are still here today, right? A notable instance was in Latin class, when my teacher was describing what incense was because we were translating the Aeneid. He explained its use in the ancient setting and connected it to a more modern setting that some of us would be familiar with, like it’s use in the catholic church. Next thing you know, we were watching a YouTube video of the world’s largest thurible in a cathedral in Spain. Picture a pendulum-like system with a 176 pound metal container holding burning incense, swinging back and forth in a church on a 69 foot long rope. Now whenever I come across that line, not only will I remember how incense can be used, but I also have the little joy of knowing how big thuribles can be. It’s these little moments in class, and the interesting, off-topic digressions we have, that give us the broader perspective of things we may have never known. Sometimes getting “deep in the weeds” is a good thing, and the smaller class sizes of Sturgis enabled us to do so. From Erin Linehan: Sturgis has shaped me into who I am today. Freshman year I came in not knowing as much of myself as I do today. For years I thought I knew exactly what I wanted to go into. Over the years I changed from medicine astrophysics to human rights to fashion design, and now, to environmental science. It was the summer before senior year that I realized I absolutely had to go into environmental science. I decided instead of researching my ESS IA data online, that I wanted to collect the data on my own. Ms. Gallo then supplied me with data collecting tools for the water, and once a week every week at 5:30 am I got up to drive to the three different locations and test the salinity, temperature and dissolved oxygen levels in the water. When I was out there testing the water, I loved every minute of it. And I realized that this is really what I am meant to do. I could not have done this without Ms. Gallo, who without knowing it, guided me in life to do what I do best, and what I love the most. We have all either already experienced this awakening moment of finding out where our true passions lie, or maybe some of us are about to. It’s these types of moments that show us how we must live to be happy. From Sam Trelegan: During my time at Sturgis I learned many things. I learned how to make friends, I learned how to drive, I learned how to use google classroom like a wizard, but most importantly I learned who I truly was. Sturgis pushed me and bent me, but did not break me. 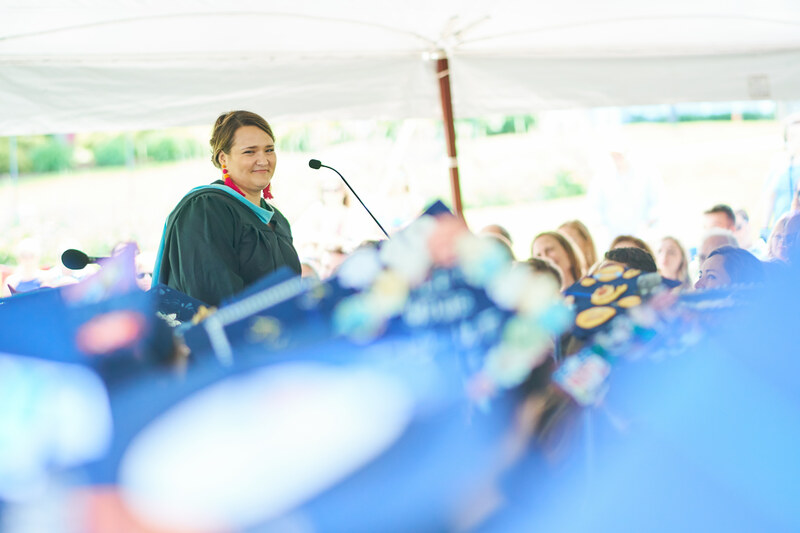 The challenge, rigor, and community of Sturgis molded me into the best version of myself. I realized my full potential, my hopes and dreams, and I forged a new global perspective. I sweated and i cried, and from the sweat and tears arose the person that I will be for the rest of my life. A person with a open mind, a open heart, and endless curiosity. And, finally, from Amber Abney: I’ve grown a lot within the last four years. I have gained knowledge, wisdom and the respect for others. 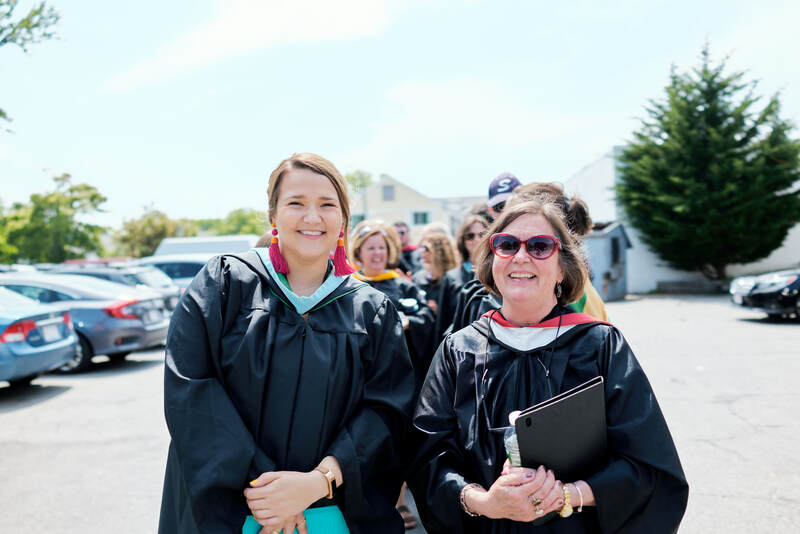 I know that I would not have been able to find the light at the end of the tunnel if it wasn’t for the hardworking staff that create an atmosphere within the school that makes each student feel cared for. I began my years at Sturgis with a attitude so wild that even a bull rider couldn’t tame my rage but I never had a reason to be upset or even a reason to be rude to anyone; I was just hurting deep down inside myself and was too frightened to let anyone in and get to know me as a person. But as high school comes to an end for me, I leave with a brand new attitude and a brand new way of viewing life. I know I will amount to greatness because Sturgis has prepared me for life’s most challenging obstacles. 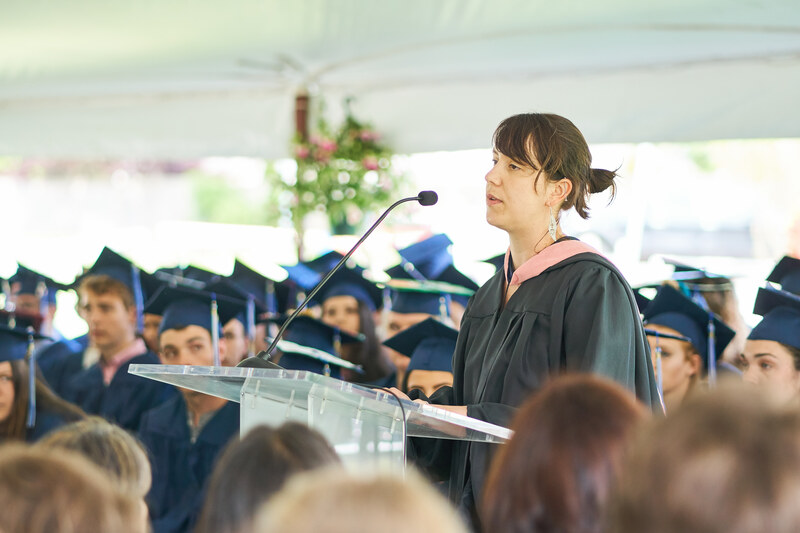 –To my initial claim: today is a momentous day, I now add the rationale: because today is a culmination of the past four years where we have all chosen to live, think, and gather with great intentionality, care, and reflection. 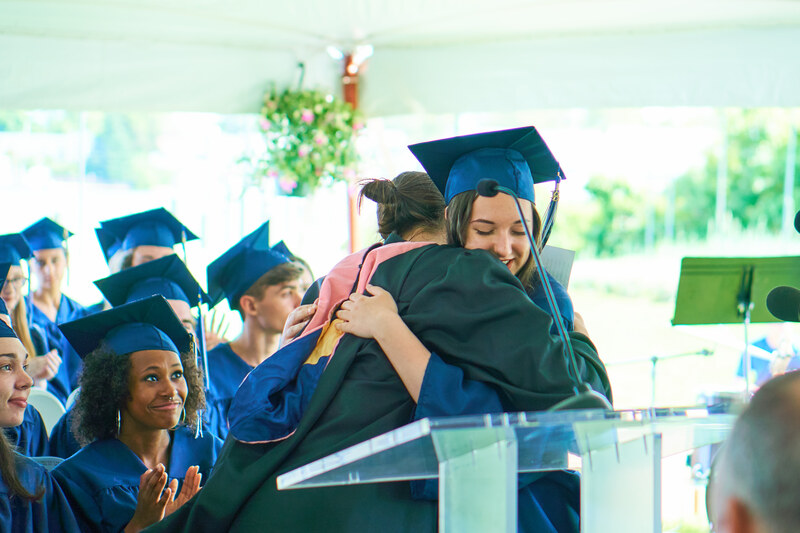 Students, faculty and family have made our collective Sturgis experience momentous, and today is a day to celebrate in that accomplishment. Iffat Farooqi, Lynn Krumveida, Colin McDonald, Toni Mullen, Rebecca Wheeler and Reegan Whipple, please stand. I would also like to celebrate two of my long-serving colleagues retiring this year who have been wonderful ambassadors for our mission and great role models for our students: Marca Daley and Jo Mary Pontes, please stand. Sturgis East class of 2018, congratulations, and thank you for choosing to see the best in each other and for making the most of yourselves. I hope that you always carry Sturgis in your hearts. Writing this speech was difficult for me. And not just in the sense that, like many of my students, I tend to procrastinate certain important assignments until the last minute. No, this speech was difficult, because I struggled to find genuine advice, given that I am still early on in this journey we call life. It was not that long ago that I was in your shoes, awaiting my diploma, wondering if I got high enough marks on the rest of my IB exams to offset my surely abysmal performance on the Physics test. 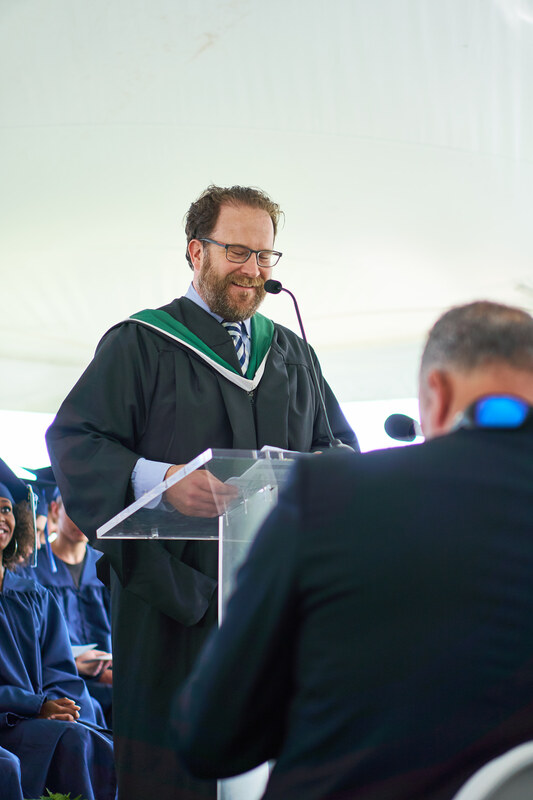 But, the main reason why I had difficulty writing this speech was because it would mean saying goodbye to my students, who have also become my friends. I have only been at Sturgis for two years, so in many ways I am still a rookie. But in that time, I have taught about 60 of these graduating seniors. If I didn’t teach these seniors directly, I got to know most of them through sports, clubs, senior week activities, or just passing by them in the hallway. The uniqueness of Sturgis has also lent itself to a lot of these connections. For one, the varying temperatures of the school, with one room being scalding and stuffy, the next being frigid, created a solidarity among the student body. Plus, let us not forget the day when the heat “disappeared to be working” and the average temperature dropped down to the 50s. Long story short, Sturgis is a very unique place. Back in 2016, when I applied for an open history position at Sturgis, I couldn’t believe my ears when Mr. Marble told me that East was actually an old furniture store. I thought I heard incorrectly. But then I visited in May and saw the wonky layout of Ms. Selim’s old room, then I saw the random pillar in Mr. Fetzer’s room, I saw the sink in what is currently Mr. Bundy’s room, amongst other eccentricities. I never would have imagined that life would bring me to Sturgis, a school in an old furniture store, but life has a funny way of surprising you. Of course, not all of life’s surprises are welcomed. There are moments when you won’t get what you want, or where you fall short. I know a lot of you have already felt this, maybe recently. But failure and rejection are natural parts of growing up, and it is not the failure that shapes who you are, but how you choose to respond to it. Because the other thing about life, is that it has a way of leading you exactly where you need to be. I know this, because I have fallen short and been rejected many times. Let me take you all back in time. You all were in 8th grade, a few inches shorter no doubt, and I was in my final year at graduate school down in Virginia. I was the same height. Being the true history nerd that I am, I applied for a Fulbright scholarship to teach English in Poland. I felt qualified, I had numerous recommendations from professors, I crafted the perfect resume, and I spent hours writing and editing… and writing and editing, my personal statement. I think you all know a little something about writing and editing personal statements? On top of my top notch application, my interview went swimmingly! All I had to do was wait, but I think you can see where this is going. I did not receive the Fulbright. I then turned my attention to teaching jobs in the United States. As I bounced back from this rejection, I applied for a job at the school where I completed my student teaching. My students were fantastic, the teachers were welcoming, I felt like I deserved this position… and yet, I didn’t get that job either. Here were two failures, back to back. There I was, unemployed in August with a Master’s degree. Suffice it to say there was at least one freak out. Was I a good teacher? Was I qualified? Should I have edited my cover letters more instead of watching The Office for the twentieth time? But finally, I got a job. In a middle school of all places. Now, I was fine with teaching middle school, but the one thing I said I would NEVER teach was 6th grade. Can you guess what job I got? I taught sixth grade for two years, and I learned a lot in that time. For example, I learned to say the word “responsibility” instead of “duty,” which I still do, by the way… But in addition to specific word choice, I learned how to be patient and I learned resilience. When I did finally begin applying for international jobs my second year teaching, I decided to apply to a school up on Cape Cod. The only thing I knew about Cape Cod was that… well there was seafood and the Kennedy’s. So yeah, my knowledge was limited. But I excitedly accepted the teaching position, because who can say no to a school in an old furniture store, I moved my entire life up to the Cape. And that’s when something amazing happened. I met you all. I can say I am a profoundly better, happier person because of it. If I had never failed, and failed that other time, I never would have ended up where I am. So you see, life has a way of leading you to where you need to be. Now, I love all of my students, sophomores included, but there is something special about this graduating class. You may not have any unifying story about winning spirit week twice, but you are unique to me; you grew up with me, as I grew into Sturgis. You are my first generation children and daughters, you are the reason why I love to come to work. Because yes, I love history and I will talk about it forever and always, but you make it all worth it. When Victoria, Ginny, Jess, and Colleen emailed me Communist memes, when Anna baked a cake for Gorbachev’s 87th birthday, and when Nick, Callahan, Liam and Sam included pictures of a garden gnome called “Gnome Chomsky” in every slide of their group presentation? That’s why I love this job. Teaching you all for the past two years has been one of the most rewarding experiences of my life. But, this day isn’t about me. Even though I’m the one standing up here, trying not to cry, this day is about every single one of you. Each of you took a different path to this day, but all of you made it. Despite the hardships you might have faced, despite the days you dreaded completing the IB requirements or coming to school driving over the treacherous “inch of snow” in your neighborhoods, you made it. 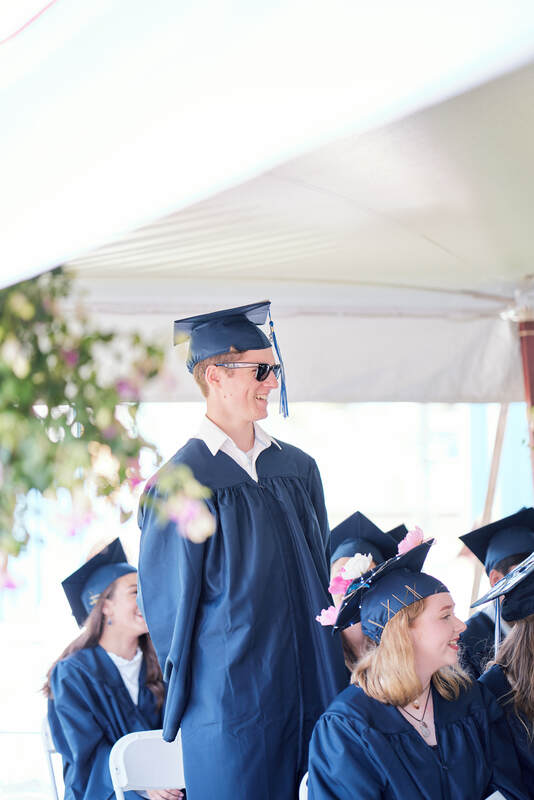 Graduating high school is no small feat; especially when you go to a school where in one single day, you could have multiple discussions, primary source analysis work, and paper two tests where you have to compare and contrast… well, you get the picture. Even though you all are graduating Sturgis today, even though you have finished your classes, finished your exams, and you are leaving high school, I can guarantee you that you will never leave our hearts… and minds. Sorry, I had to make one more history reference. If I can leave you with one final piece of advice, it is this. Life is what you make of it. Every experience can change based on your perspective, how you choose to approach it. It is all too easy to give into cynicism. So choose positivity; choose love. It is toxic and exhausting to respond to hatred with more hate. Instead choose to turn that frustration into action, do not wallow, use your agency and be the change you want to see. Because if you choose to look at life as an adventure, if you choose positivity and work hard every day to be happy and live life to the fullest, then you might end up in an old furniture store, exactly where you need to be. I love you and will deeply miss all of you, and I can’t wait to see what you accomplish next. Thank you. Hey! So, I’m not sure the easiest way to start this. I’ve thought about it for a while now, and I can’t wrap my head around where to begin. If there’s anything I’ve learned from the I.B., it’s that starting an assignment is always the hardest part. The task is simply too big. I’m sure many of you all know that feeling, having written five I.A.s, a twenty page research paper, not to mention an innumerable amount of fetzays that each seem more daunting than the last; So I bet you can understand the hesitance I have with the overwhelming endeavor of starting something. Not only that, but I feel underqualified. Underinformed. I’m making a speech to a group of people that have already done exactly what I’m advising them on. We finished. We’re graduating. That’s that. I don’t know any more than anybody else about the Sturgis experience. I only know my relationship with this school, so where do I start when tasked with describing everybody’s? But I guess that’s another thing the I.B. has taught me: How to write an essay about something you don’t really know anything about. I guess, though, that I can start at the beginning: Freshmen year. I think, in general, as freshmen, we all had vaguely similar traits, traits consistent with any 14 year old: We were unsure of ourselves, but we didn’t know it. We hadn’t grown up yet, but we would never have admitted it. We were all shuffled into this rickety old building, where we slowly acclimated to this new stage of our existence… High school. 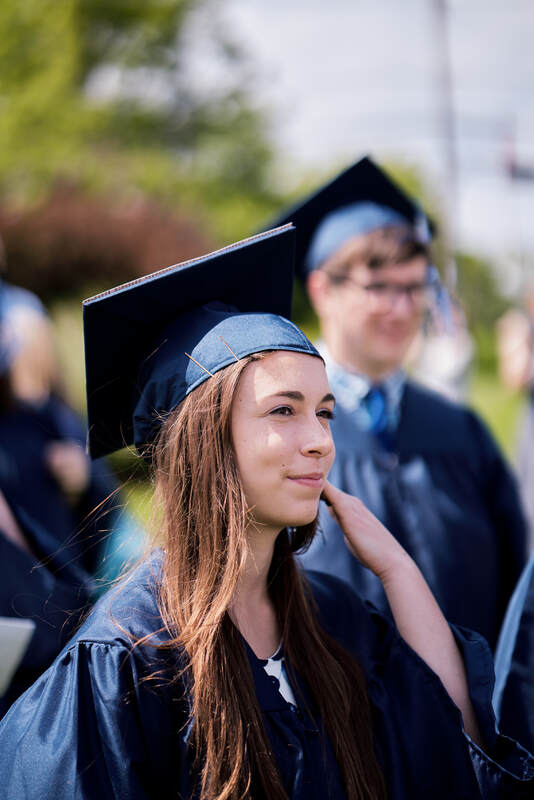 To the world at large, Sturgis is consistently recognized as one of the best public institutions in the country, but to us, it was just high school. We weren’t being groomed to all attend the best colleges, we weren’t being taught to look down on those who weren’t receiving the same education as us. We were just, well, going to high school. This is what I think I value most about the Sturgis experience, and the principle of “IB for All”. Sturgis is able to gracefully toe the line between excellence and acceptance. It gives everyone the opportunity to be as successful as we want to be, to our own standards. Nobody is told that they can’t; that they can’t succeed academically, athletically, or artistically. Every student is offered every opportunity. There is no system put in place to categorize or divide us in Breakfast Club-like classifications. We are unified from the beginning, working towards a common goal of our own version of excellence and success. The only issue with this mentality is that I think it may have made us take the experience for granted. So take a moment now, and recognize how lucky you are. You don’t have to have liked these last four years, but I think you should at least try and respect them. It’s important to understand that you, by sheer dumb luck, were picked out of a hat to receive one of the best educational programs in the state, with, at least I think, some of the best teachers in the world. I didn’t think about that even once these past four years. I was just coasting through high school, waiting to leave Cape Cod, go to college, and grow up. I never thought of my high school experience as special, or unique. I liked my teachers, I loved my friends. I did well academically. I enjoyed the isolated moments of high school, the day-to-day emotions of it. But as a more general concept, I never saw high school in its whole as anything more than an obstacle, another four years in between me and the rest of my life. Looking back on it, though, I began to really absorb where I actually was. Each of those isolated moments, each of the individuals who made up the Sturgis community, helped to guide me in the direction that I wanted for myself. 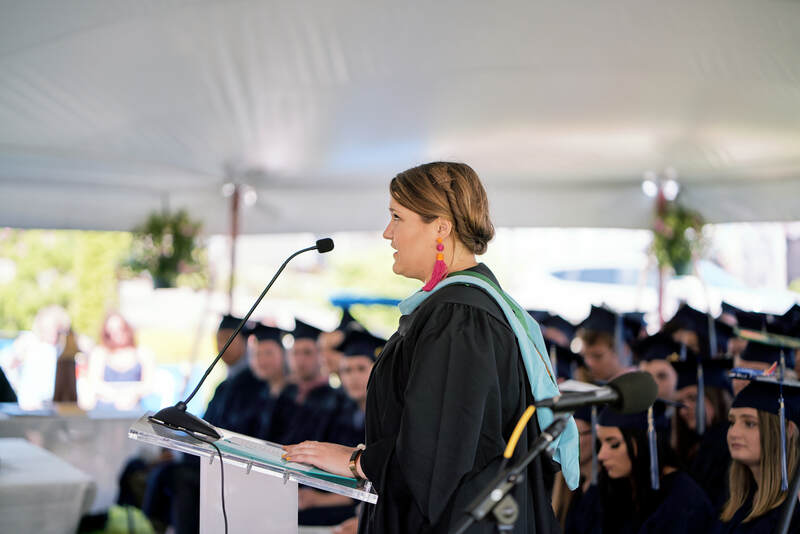 When shifting our eyes towards the future, as most grad speeches do at around the three quarter mark, which is about where I am, I feel even more out of my depth. I’m only 18 years old! I don’t have the qualifications to predict where you all will be in another 4, 10, 20 years. I don’t have the qualifications to predict where I’m gonna be in 10 years! I’m a hot mess! I don’t know if we will be successful, or what successful even means, cuz it’s a pretty loaded term. When I think about the future, I can almost get nauseous imagining the impossibly large amount of choices that we’re going to have to make, the problems we’ll have to solve. The future is enormous, and as I mentioned before, with a task so daunting, the hardest part can be knowing where to start. Luckily, however, I think that’s the greatest gift that Sturgis has given us. It’s given us a place to start. We weren’t told where to go, but we were told how. We were given the tools to individually fight against our own mediocrity. I believe that Sturgis has allowed each of us the capacity to go out into the world and find what each of our own versions of “success” really is. So thank you to my teachers, who have put up with us for an impressive amount of time, and thanks to all of you, the class of 2018, among whom I have found what I believe will be lifelong friendships. Thank you, Sturgis, for showing me where to start. 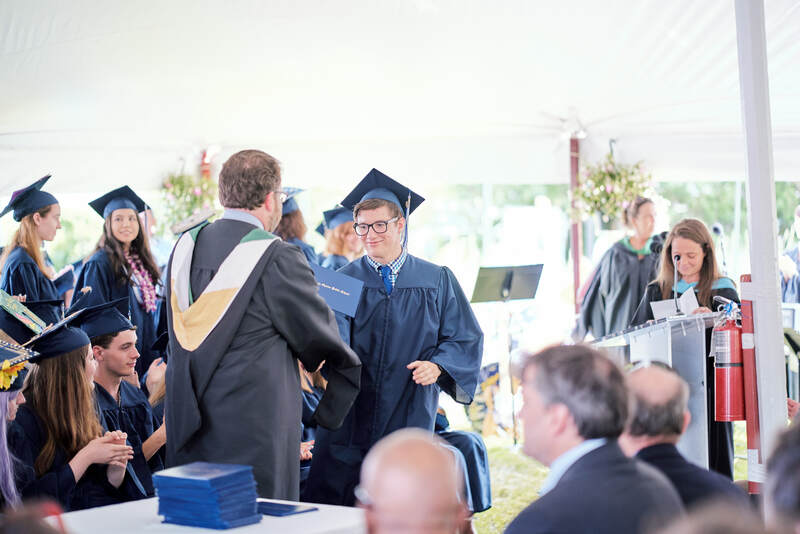 The Ryan King Award is given to the graduating senior who most exhibits perseverance, determination, resolve, and a positive attitude in their academic pursuits at Sturgis. Perseverance. Perseverance is a thing everyone here has. Grandparents and parents persevere to raise their children. Teachers persevere to educate children. Just surviving childhood and adolescence takes perseverance. It is a trait which is held in high regard in our culture – not just for the day to day tasks that we push ourselves through like finishing a homework assignment or cleaning the house when we are out of energy – but for those tasks which are so menacing that one might quit or forfeit rather than complete – for those tasks that require …..something else….. something extra deep down to make it through. We write about these people in our famous pieces of literature. We make films about them. We repeatedly tell these stories of triumph over tribulation. 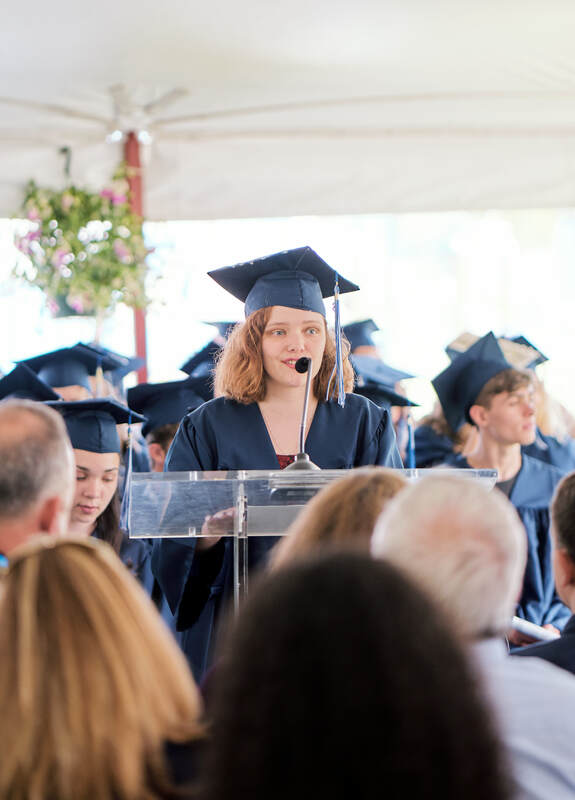 Today, I get the pleasure of telling you about one student who has shown incredible perseverance this year to complete the full IB diploma coursework – despite events that conspired against her to inhibit completion. And because I know how humble this student is, I think she may feel more comfortable with me complimenting her through one of her favorite stories about perseverance, Harry Potter. This student is a self-ascribed Hufflepuff. Pottermore.com describes her, then, as a person who values “hard work, patience, loyalty, and fair play.” This is accurate. This student worked very hard. She found a way to submit her EE, multiple musical compositions, and a Music Links Investigation paper (and I am sure countless other things in other topics that I don’t know much about..) on time when others would have asked for an extension or given an excuse. She worked hard to make sure these were not just done to completion but done to her standard – a very high standard. She showed incredible patience each day she went to the Salvation Army to teach children to play guitar – waiting and watching them plunk out each note. She showed patience with herself. As her musical skills gradually grew, she accepted that there would be setbacks and that things wouldn’t always turn out just the way she had hoped, which allowed her to grow at a rate that was truly inspiring. She showed loyalty to her friends and her teachers by constantly offering them gratitude (through the most wonderful thank you notes) for all that they had done for her. And, fair play? This student felt bad asking others to accompany her solo performances because she did not want to give someone else an unfair amount of work to do. Because of her circumstances, all of these Hufflepuff stories of hard work, patience, loyalty, and fair play – took this student perseverance to complete. She didn’t have to do any of these things but she chose to push herself because she had the …..grit?….. …. the something else…. motivating her. And I think that something else is kindness. This student is deeply kind. It is that kindness that made her persevere and not quit. It is kindness that made her not want to let anyone, including herself, down. 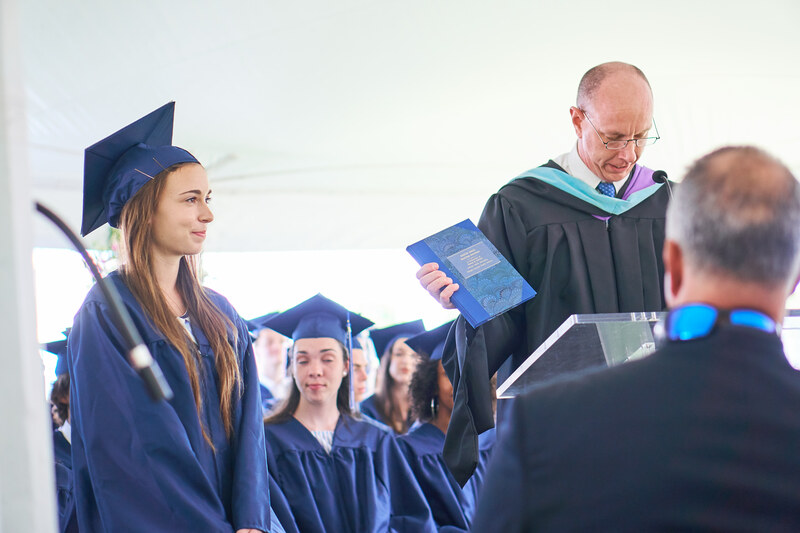 And while Dumbledore might say, “Kindness – a trait people never fail to undervalue.” I for one will always appreciate all of the kindness this student has shown me and the way that kindness was able to motivate this student to do so many great things this year. And so, for so many reasons, it is my great pleasure to present this year’s Ryan King award to Eliana Freelund. She will be missed! Mr Marble, Mr O’Kane, Colleagues, Members of the Board of Trustees, Parents, and most important, Graduating Seniors: the Class of 2018. I am going to speak to you today of two passions: music and social responsibility. In 1964, when I was a freshman in highschool, the world was changing. How did I know it was changing? Not as you seniors might guess, but probably as your grandparents know. We had no computers, no mobile phones, and consequently, no buzzfeed or twitter or facebook to feed us information or news… What we had was school, along with libraries, television, newspapers, radio and magazines. It was 1964, after all. No, I knew the world was changing not through the news, but through music. In 1964 I became a fan of folk music; I bought my first guitar; and I learned to play “Blowin’ in the Wind,” a so-called protest song, written by Bob Dylan. And let me tell you, this song is as relevant today as it was when he wrote it. But I disagree with those who call the questions ‘rhetorical’ – because that implies that the questions are only posed to make a point, rather than to be answered. In the 60’s, the song became a symbol of the Civil Rights movement… and of the Vietnam War… Back then we didn’t have the answers, but now I think that in our day… your day… today … 2018… more than 50 years later, these same questions require answers! How many years can a mountain exist, (or the arctic ice cap, or the sand dunes of Cape Cod) before they’re washed to the sea? If we don’t listen to the scientists, heed the statistics, and take action about climate change and global warming, it won’t be long at all! We’ll have our answer. How many years can some people exist, (the Dreamers, immigrants searching for a better life, refugees, transgender, Indigenous peoples, )… before they’re allowed to be free? If we don’t acknowledge and even celebrate diversity in our country, that question may never be answered. How many times can a man turn his head and pretend he just doesn’t see…(doesn’t see the plight of those who are homeless, the destruction of our environment, the erosion of trust in public integrity …) These answers cannot simply be ‘blowin’ in the wind’ – these answers must be in actions that we can and should take, and in our ability to empathize with our fellow man. Chris Jordan is an artist, a photographer who cares deeply about our society…but he is also troubled by our society. His work focuses on phenomena that define America; it is about “the behaviors that we all engage in unconsciously, on a collective level.” In TOK, I often use his 2008 TED Talk to illustrate how one individual can make a difference through creativity and empathy. 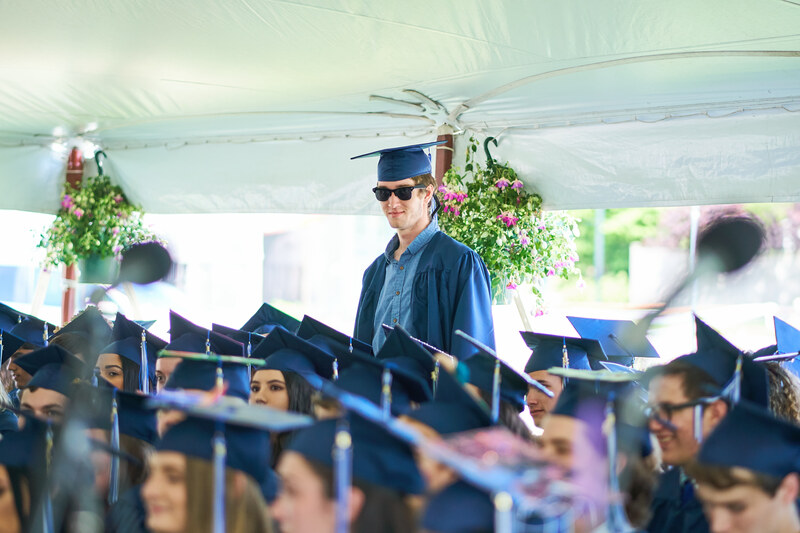 As you head out into the world, embrace your passions as you embrace your music; and embrace the life lessons that Sturgis and the IB have taught you. Why? You know the answer yourselves… But if you want to hear it once more, here goes: For the times, they are a changin’! In 20 years, the world can change. Our world can change. Even if some of those changes may seem small at the time, over the course of time, the changes can be profound. Take, for example, Sturgis. 20 years ago, a small furniture store in the middle of Main Street, Hyannis, was turned into a school. With small changes, it grew and it grew, and it kept growing, with excellent teachers, faculty, administration, students and families, with a rigorous IB program available to all students, with classes that force you to expand your mind: studying three languages, exploring the Theory of Knowledge, CAS. As Sturgis grew, eventually requiring another campus, this local, Cape school helped to shape us into world citizens. And on top of all that growth and with all of those small changes, year after year, it was nationally recognized in US News and World Report. 20 years ago, our graduating class wasn’t even born. And yet, here we are. 20 years since the founding of Sturgis and we are graduating from a school that has had such an impact on our development. But, as we stand here right now, our future is hard to see. The economic climate is improving, but the political climate isn’t getting any better. The actual climate isn’t getting any better either for that matter, and let’s face it, today is a little muggy. And yet here we are today, expected to take on the world with just our cap on our head and our diploma in our hand. How are we supposed to know where we’ll end up in 20 years time? But you know what? I’m not afraid. No, I’m not afraid. I’m scared. Because who isn’t scared of the unknown? Especially today when we’re focused on the road that lies ahead and what will become of us once we say our goodbyes and leave. But we can’t let our fears of the unknown control us. Franklin Delano Roosevelt once said, “the only thing we have to fear is fear itself”. We all know that important quote. But I want to emphasize the second part of his quote, the part that is so often unheard: “the only thing we have to fear is fear itself: nameless, unreasoning, unjustified, terror which paralyzes needed efforts to convert retreat into advance”. I think it’s unfortunate that many of us don’t know that part of the original quote, especially now in our world, when it’s so important to remember Not to Retreat. We need to step out of any corner we back ourselves into and we need to begin taking those steps towards progress again. We have to move forward towards the problem and bravely face our fears. It’s important now more than ever that we start making those small changes to take back control in our lives. The Class of 2018 is in the front seat; and, we must never let anyone, or anything take that away from us. With the skills and tools we have learned from Sturgis, we are able now to take a stand against Fear. We are not the same people we were when we first started here four years ago—thankfully…or hopefully in some cases… we have matured. 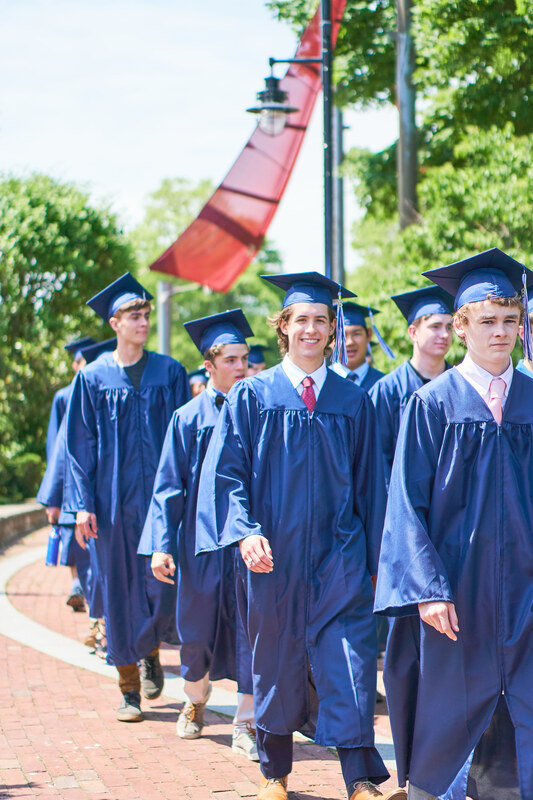 What this school has been able to teach us, not just academically but personally, over these past four years has given us the skills we will need for the rest of our lives. For myself, I have learned how to successfully pull an all-nighter, pass in the assignment, and then cat nap later in the nurse’s office. Shout out to Mrs. O’Toole! But more seriously, those same IB traits that seemed vague or impossible for me to develop within myself, are now characteristics I would proudly use to describe myself. I have grown so much as a thinker, actively reflecting on the activities I do, and in my ability to communicate with others. As a 14 year old, the idea of public speaking shook me down to my core. But after multiple practices with class presentations, orals in both English and French; here I am. Now, would I be able to read this confidently and exclusively to you in French? Mom, Dad, Madam Blanc? Non, je suis désolée. One step at a time. Here I am, standing in front of you, knowing that in a few short months, I will have to communicate to new people who I am and what I stand for. But remembering FDR’s quote, I will not be scared. The idea may seem daunting at first, but I know I will always be able to fall back on the skills that I and the rest of us have learned during our time here at Sturgis: to name a few: embrace a challenge, expand your worldview, and don’t be afraid of change. But of course, I would be remiss to say this was our own doing. We had so many fundamental partners along the way. Our friends, our family, our fellow students, our teachers, and guidance counselors were by our side so many times when we couldn’t do it alone. A special thank you to all our teachers throughout the years here at Sturgis who cared–truly cared–unlike any support I’ve ever heard of at other high schools. Unfortunately for our college professors, you’ve set the bar very high. This support our teachers gave us is so uncommon, but so greatly appreciated. Personally, I had teachers who agreed to stay after school with me for hours and work on those big projects I was late with. I had teachers who personally tutored me over the summer so I could get into the math class I wanted to be in. And, I had teachers who were so understanding and so supportive when I had a family member pass away. So here’s to our teachers! I hope that they feel as though they are graduating along with us; and, I hope they know how truly thankful we are for their lending us many helping hands as we all fought to cross this finishing line. And here’s to those loved ones and friends who we’ve lost along this journey. It that may be someone who’s passed away, or someone we’ve lost contact with. They too gave us the support we needed to get here. And, while they may not be able to sit with us here today, they are within our hearts and minds, and we give them thanks as well. And, last-but certainly not least, here’s to us, the Class of 2018. At the end of the day, we were the ones that sat the exams, showed up to class, participated and did the homework. We can now sign the book and ring the bell. Marking the closing of one chapter and the beginning of another. May this journey take you as far and wide as you can go. May you find peace and happiness wherever you wander. And, always proudly tell others that you graduated from Sturgis Charter Public School (East campus-of course). These past four years are something I will never, ever forget, I hope you don’t either. And I hope this diploma from Sturgis will always remind you of how you pushed yourself and came out on top. I wish the best of luck to you all, and congratulations. We’ve made it! Gretchen Buntschuh was a colleague of ours who taught English at Sturgis and influenced students and colleagues with her grace, insight and command of language. Sadly, Gretchen died of pancreatic cancer in 2010. 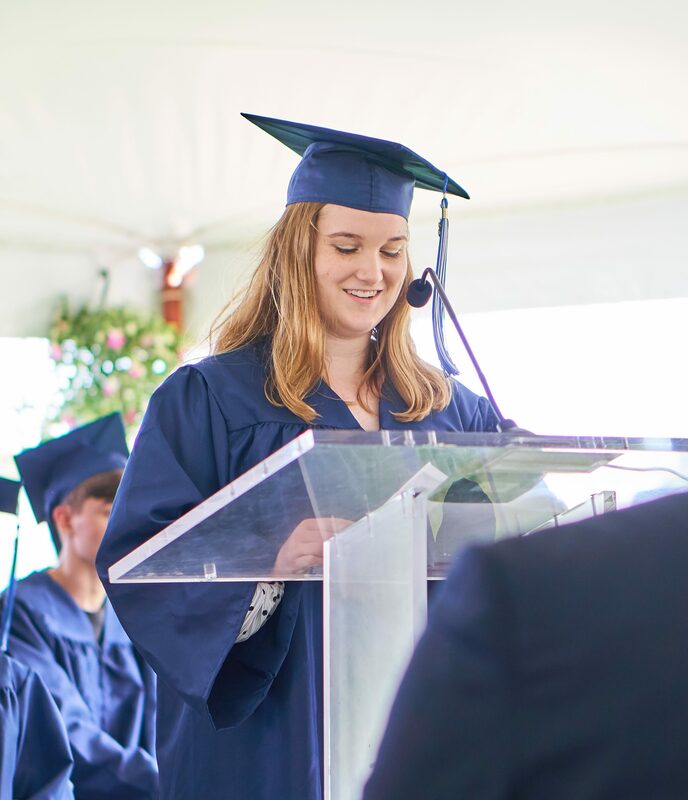 The Gretchen Buntschuh Literary Award is awarded each year to a graduating senior who has demonstrated a genuine interest in literature and gift for language. In her time at Sturgis, she has been involved in Relay for Life, Key Club, Prom Committee, Amnesty International, Yearbook, and World Challenge. Some of her writings have been published on professional blog sites and I’m told she is currently writing her first novel. Upon graduation she plans to pursue a degree in journalism. 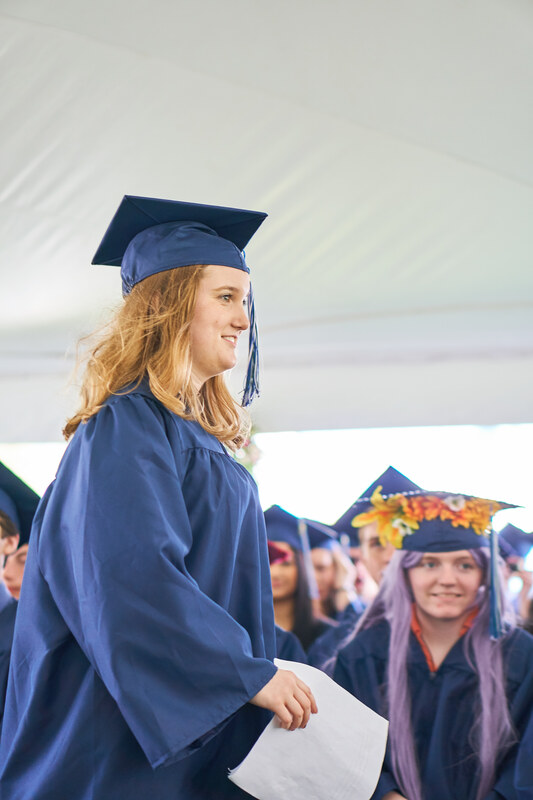 In addition to this $500 scholarship, Talin Bookbindery in Yarmouthport has donated a beautifully hand-bound collection of Kristen’s essays written during her four years at Sturgis. Talin hopes to inspire fine young writers to continue writing and to develop an appreciation for book arts and the ancient craft of bookbinding. Congratulations!